This section is used for mapping parameters specific to SPS Cloud EDI connector configuration. The Integration Configuration screen can be opened in SAP Business One: SPS Integration > SPS Integration Setup > Integration Configuration. 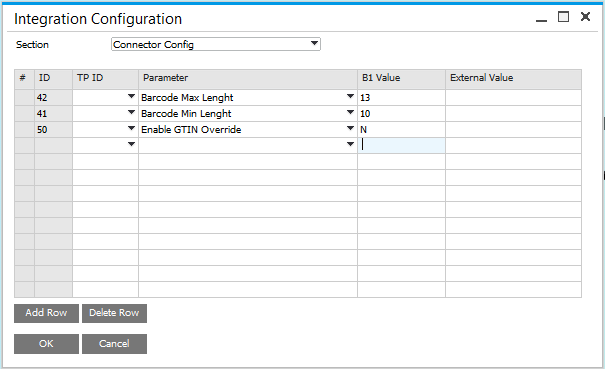 See the screenshot below for an example of mapping Connector Configurations. Map parameters needed for specific connector configuration. ALLOW_STANDALONE_810 - Allows for the creation of the creation of Invoice EDI documents (810) without having an incoming Purchase Order EDI document (850). ALLOW_GTIN_OVERRIDE - For an 810 document, allows for item data to be pulled from SAP Business One Item Master data (OITM) instead of the default 850 data. N: No, don't allow standalone documents. Y: Yes, use SAP Business One Item Master data (OITM) instead of the 850 item data. N: No, don't use SAP Business One Item Master data (OITM), instead use the default 850 item data.